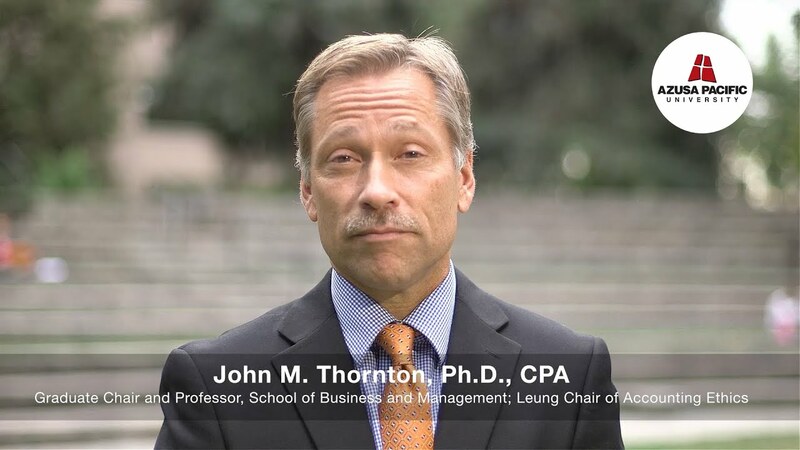 John Thornton, Ph.D., is professor and LP and Bobbi Leung Chair of Accounting Ethics at Azusa Pacific’s LP and Timothy Leung School of Accounting, where he focuses on developing future accounting professionals of competence and character. He has held faculty senior leadership positions at Washington State University and the U.S. Air Force Academy, and his research interests focus on ethics and the accounting profession, with recent emphases in auditor independence, auditor litigation, and whistle-blowing. Thornton is a nationally recognized author and speaker and serves on several editorial boards for accounting ethics, forensics, public interest, and accounting education journals. He is past chair of the American Accounting Association’s Professionalism and Ethics Committee and AAA’s Public Interest Section. During the time between his undergraduate and graduate degrees, he held staff- and senior-level positions in local and international public accounting firms. He’s a member of the American Institute of Certified Public Accountants and the American Accounting Association.